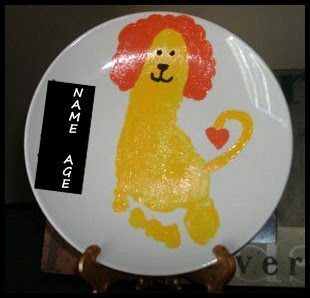 To make the Footprint lion: place a yellow footprint on a plate (paper, tile, anything you heart desires!) Next, paint a yellow tail, an orange mane, and orange on the tail. To make this on a plate, see painting with enamels description. I purchased the holder from Micheal’s in the picture frames department.